Photographers – and artists of all types – often receive requests for donations of their art, time and talent. In my ‘former life’ as a musician, people would frequently request me to sing or play for events…for free. Now, as a photographer I receive requests for donations of prints. Artists create for many reasons. Self-expression. Challenge. Growth. Change the way one thinks. Passion. Find meaning. An outlet for emotion. Find beauty. However, most every artist I know also has a goal of selling their work. It would not be practical to donate one’s work to all of the charities, groups, and organizations that ask for donations. Donation limits of one’s art must be set by each individual artist, much like an individual makes decisions on what is a personally appropriate amount for financial donations and charitable gifts. I have selected two primary groups that I support with donations of my photography, one of which is the Carthage (IL) Memorial Hospital. My elderly father is in supportive living in the small, rural Illinois community. My family relies on the care and support the medical community provides him on a regular basis. While many medical facilities in small communities such as Carthage are facing serious decline, this medical community continues to grow and provide progressive, vital services. Each year the community holds a Gala Benefit and Auction for the hospital, and for the past couple of years I have donated a framed print in support of their goals. Additionally, a percentage of retail is donated to the hospital for any additional print sales on the selected print. This year’s print is an especially fun, and special, print; an image I made in Carthage on one of my recents visits. For years I have driven by the old, ‘retired’ (some might call it abandoned) filling station. One day as I drove by the station this old Plymouth was parked in front. I have no way of knowing who parked the car there or why the car was parked in that location that one day. I had not noticed the car parked there before, nor have I seen it parked there since. 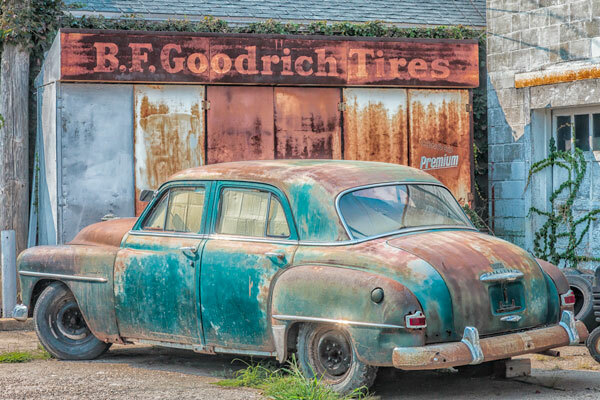 I do know the aged, rusty car posed so perfectly in such a historic setting captured my attention and I, of course, stopped and photographed the scene. The image sat on my hard drive for a period of time; I wasn’t quite sure of what direction I would take with the image. When the hospital recently contacted me regarding an image for this years donation I gave them three or four choices and this is the image the Gala committee selected. The hospital is celebrating their 65th anniversary and this image brought back memories of that bygone era. This image, “A Glimmer of the Past,” is being offered as a limited edition print, with the donated print being #1 of 10. It is a pleasure to support and help this worthy organization with the donation of my work, just as I support and help the Nolensville (TN) Historical Society (my second charity of choice) with the donation of my work. While we artists create for many reasons, helping others through photography holds a special place amongst the other valuable motives. This entry was posted in Sue Henry and tagged Carthage IL, Charity Print, Fine Art Photography, Limited Edition Print, Nashville Photography, Sue Henry Photography on March 19, 2015 by f4studionashville. This car belongs to Tony Goetz. It was my dads. It use to sit on the property owned now by the hospital. My dad thinks it is a 1952. It sat in the garage that was just moved to Build the new Memory care facilities. My dad purchased it for $75.00 around 1974, we think.